We are going to be inundated this week with Black Friday offers and I’m sure you all have your fingers at the ready to click buy when your list of items go on sale. It can be somewhat daunting and an all round crazy week coming up. We’ll try to keep you updated with the best of these offers. One that instantly caught our attention is this amazing palette from Charlotte Tilbury. 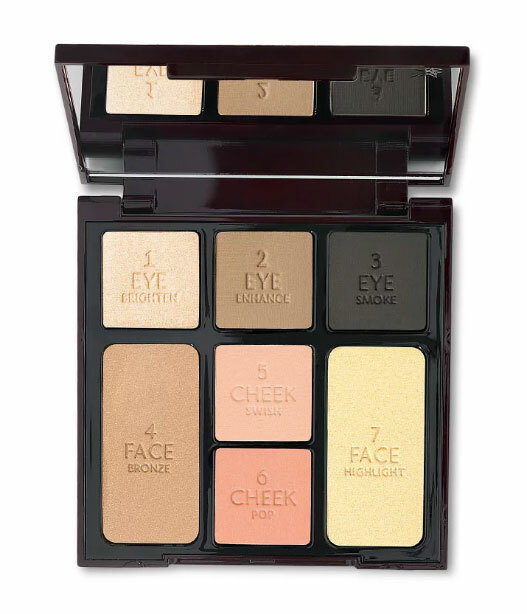 You may remember it being launched, I certainly do because it has everything you need in one palette, the perfect smokey eye trio with a pale golden base colour, a soft taupe to enhance the crease of your eye and a dark grey for the eyelash line to create that smokey finish. It then has a bronzer, a highlighter and for the cheeks is Charlotte’s famous swish and pop duo. I loved this palette when it was launched, it is definitely one of my favourite and most used palettes. It’s usual retail price is £49 but for Cyber Week, Charlotte Tilbury is offering 40% discount, so it is yours (or someone on your Christmas list) for only £29.40. This is a true bargain. Charlotte Tilbury doesn’t usually offer many discounts throughout the year. To be honest, she doesn’t need to, her products need no help to sell. Black Friday can send us into a spending spree that we later realise wasn’t quite worth it as we end up spending too much on things we really didn’t need. So, be wise, get your list together, seek out the true offers, get ahead with Christmas shopping and save your pennies. It’s a win win! Charlotte Tilbury’s Instant Look In A Palette just happens to be a great place to start!